You must make reservations at least 5 minutes in advance of the time at The Kasbah Lounge - Sacramento. Kasbah Lounge in Sacramento, California offers a menu that is intended to promote socializing and sharing. Spices and flavors of the dishes come mainly from the Middle East and North Africa. Kasbah Lounge offers many traditional meals, while also showing creativity in more innovative options. There are weekly specials, as well as homemade desserts, too. Share small plates around the table for a unique experience. Some options include falafel, chili chicken wings, tabbouleh, grilled flatbread and stuffed dates. Kasbah Lounge also provides many larger entrées for those who prefer them. 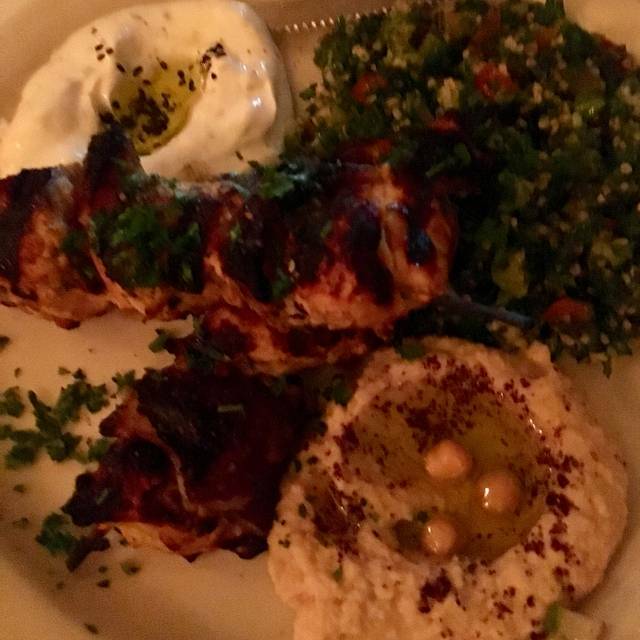 Try the chicken shawarma with hummus, vegetable kabobs or kefa tagine. Delicious vegan options, great atmosphere. Delicious Mediterranean food that's flavored with herbs and spices, plus a very decorative setting. And the price is surprisingly affordable - we expected to pay more. The one waitress was busy training a new server so our service was on the slow side. I love this place! The happy hour is amazing☺️ Be sure to try the fried chicken peas... We finally tried the beef shawarma.. So tender and delicious. The best hummus ever. I love the atmosphere. The owner is so nice! Great place to hang out and relax w great food! I really like Kasbah, but unfortunately this experience left me disappointed. The food was great, but the service was really unacceptable. Having served for years, I try to be understanding and accommodating, as I know things can get overwhelming and crazy, but being rude isn’t necessary. We decided as a group to share plates and some of the items were forgotten, no big deal, so we ended up ordering one more dish. We were all finished and the wait for the last dish was really long. After asking our waitress if she’d put it in, she explained it would be a few more minutes. At that point, they’d cleared all of our other plates and it really wasn’t worth an additional wait. We asked if we could just cancel it (although I think she might have forgotten to put it in) and that’s when her irritation started. She did cancel it and came right back and silently threw a check on the table, pretty much abruptly ending our experience. It happened to be my birthday (which is why I brought a party of 9) and my mom explained that there was a dessert in the back. The waitress came back with the box and silently set it on the table. She ran the credit card and put that down. Not a mention of thank you and more of a feeling of “get the hell out”. There are too many great restaurants that offer great food and service, so despite the good food, I won’t be back. Completely underwhelming. Food was lacking flavor, service was too relaxed had to ask for water, tea refill and pita bread twice after the server said he was going to bring it by. It was not busy at all. Watched people walk out due to no host staff. Ambiance was very dark, reason why you ask??? The overall state of the restaurant is in complete disrepair. Very disheveled, unorganized and mismanaged. This place has a lot of potential but the owners need to put some $$$ into redecorating and supporting a manager to keep it clean and up to date. Service was prompt and food was excellent, has a great Ambiance to it a little on the dark side lighting wise but it's very cozy. The pita chicken shawarma and chicken wings were delicious, especially the latter. I had never been to Kasbah, but I will definitely be going back. Great place for a vegan meal as they offer delicious vegan burgers, gyros and appetizers. Best Mediterranean food I've found. Great service. I absolutely love coming here. I've made it my go to spot for taking new friends out, dates, or just going with groups of people to celebrate an event. I definitely love the vibe, the employees, and just feeling welcomed to enjoy a meal and live music. Excellent food, excellent service. Teenager with us loved the Impossible Burger, we loved the mid eastern dishes and were happy to see a vege gyro. It was great. The food was perfect as always. Very fresh, flavorful and cooked to perfection. Service was wonderful. Great ambiance and the belly dancer added a fun element to the evening. I normally love this place. Though, they were understaffed and forgot about us a number of times. Good thing I enjoyed my company. It was a rainy day in Valentine’s day! The place was cozy with the perfect Ambience for the ocasión, they bring you the food in a moderate time, the amount of food it’s perfect to share and the Mixed of flavors are amazing! 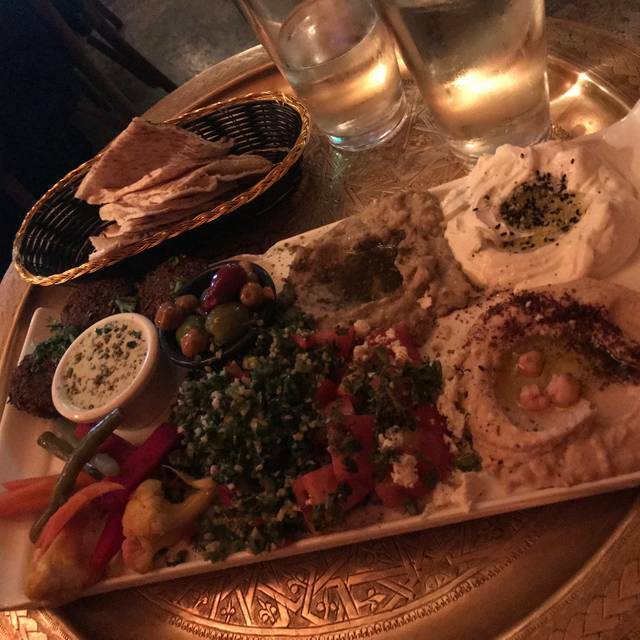 The ambience was so good with middle eastern tuns that go perfect with the type of food you are eating, they have also a belly dancer that goes from table to table and put a good show, that was pretty cool! Very friendly people, great food. Food and drinks were amazing. Only ding was that our waitress ignored us the whole night. I had to call or physically walk up to her to get any service. Great restaurant but this particular waitress gave no service, especially when it was a relative slow night. Will go back again. It was a little noisy but not too bad. They make allowance for vegans which is a big plus. Surprised my girlfriend with dinner there with friends and family waiting. Staff was fantastic as was the good. Hoping to dine there again on a day when they have Belly dancing next time. We discovered this gem while traveling from Seattle to San Diego, we loved it so much we stopped on our way home! The chicken kabob was heavenly. Everything is packed with flavor!!! Nice ambience and Great food! Great place with wonderful food and ambiance that is quite romantic and cozy, especially if seated on the wall seats with cushions. Service was fast and our server was very pleasant. The only disappointment of the evening was that the belly dancers were not there during our visit (7-8:20ish) and we were told that they can show up around 9 pm or later as they sort of have their own schedule. Seated early for saturday dinner reservations. Even though the place was busy service was still fast and food was great! We are big fans of Kasbah. We have found them to have consistently delicious food. They are especially good with seasonings. They represent a broad spectrum of Middle Eastern food. For the DineDowntown week they always add something very special to the menu. It might be a good idea to come close to the time they open because they can be very busy. And they can stay busy even late night. The atmosphere is incredibly relaxing and that vibe sets the tone for enjoying and not rushing through meals. My first time here after being at Tapa the World many times and it's just as good. I think it might be even a little bit nicer looking on this side. The food was really good and people nice. Yum!!! Chicken kabobs were fantastic! Our waitress was super accommodating to swap my rice and pita for extra grilled veggies - thank you!! Turkish coffee was a nice end to our meal and helpful for the 5 hour drive after dinner. We will be back!!! All four of us thoroughly enjoyed the evening. The food was amazing. Complex spices and unique. The food was delicious. Unfortunately, the service was extremely slow. Our group had to repeatedly ask for our server and even then it took forever. We celebrated a birthday here and had a wonderful time! The food was unique and tasty and the service was friendly and unpretentious. Excellent food. I really appreciated how many vegan options there were. The food was incredibly fresh and flavorful. The atmosphere was unique. Once it got a little busier the service had gotten a little lax but it wasnt something that would prevent me from eating here again. I was very impressed. 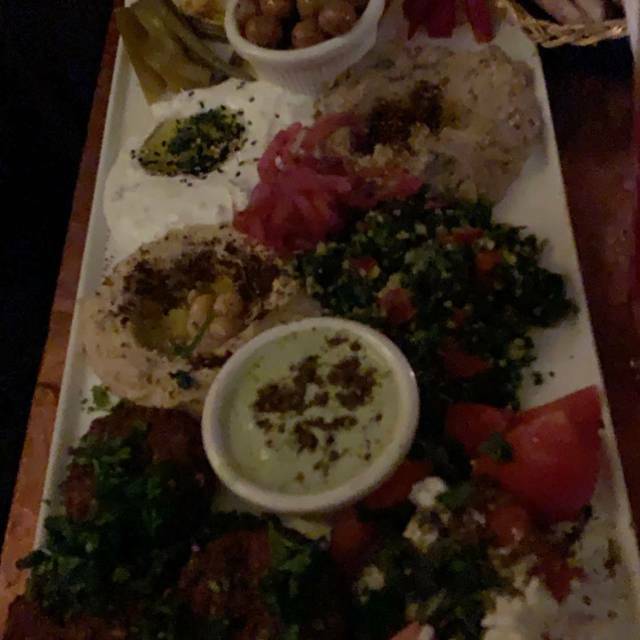 First time at Kasbah Lounge for a company meeting of 15 and we were very pleased with the service, food offerings and ambiance. Nice selection of dishes available, something for everyone! The food was excellent and healthy with a lot of it per portion....Prices are reasonable and the server was helpful and very friendly. We had a great time, always do!Met friends, stayed a long time with no pressure to leave. We lingered over dinner and after dinner brandy for hours, terrific! The menu and the food were superb! I got the tasty lamb dumplings. Would return. I reserved a table for a double birthday celebration of my friends. We were seated promptly. The place was lively. There was a belly dancer performing which was entertaining. 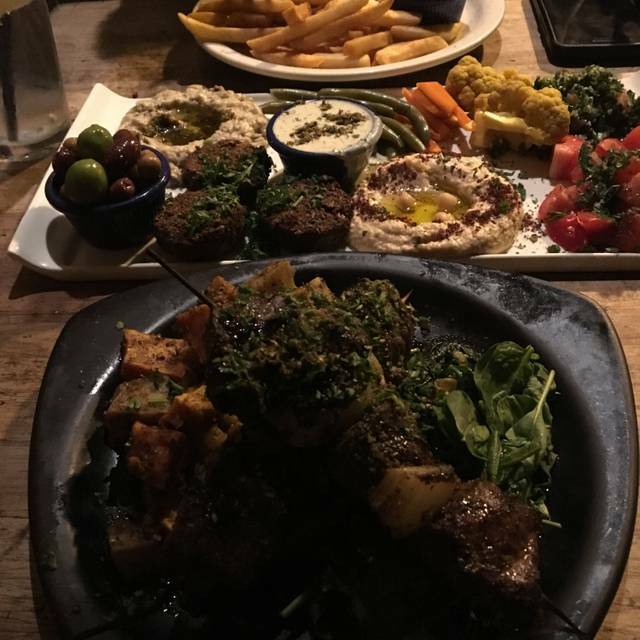 They serve Mediterranean food which is very good and tasty and reasonably priced. My only disappointment is that the service was not consistent. One of the server was very friendly engaging and attentive but the other one was totally opposite. Had experienced the food before at a wedding loved it then so wanted to try the brick and mortar spot. We loved the food!